This article explains how you can continue using your same, old email address with GMail. I love the simplicity of GMail, and how easily it integrates with my Google Drive and Photos. It’s also got a great spam filtering and security features. I can also print PDFs without needing to download these onto my laptop, something which is no longer available in Yahoo. My mother and wife use Yahoo, and they are increasingly irritated with the changes to the Yahoo design and to its poor spam filtering. They also have a hard time letting go of their Yahoo email addresses, as they will need to update their profiles on various websites. This post explains how you can still use your existing email address but do it with GMail as your email service provider. 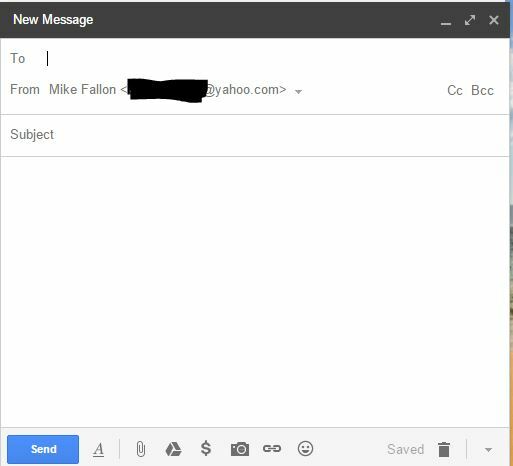 (1) As a user, I want to be able to send & receive in GMail using my existing Yahoo email address. (2) As a user, I expect to be able to easily see my Yahoo emails in my GMail account. (4) If I use the GMail app on my handheld device (smartphone or tablet), I should be able to also send & receive using my old Yahoo address. 10 steps and screenshots are provided below. It doesn’t take very long to set up. (1) Once you’ve logged in, you should see a settings icon on the right hand side of the screen which looks like a little sun. Click on this and select the “Settings” link. 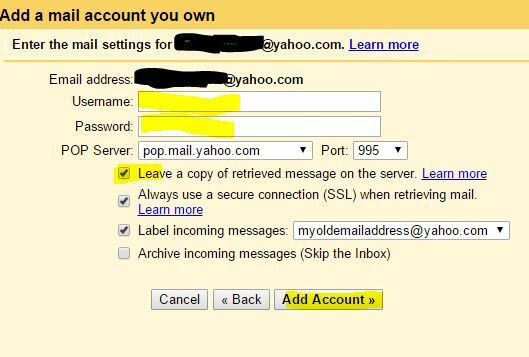 (3) Follow the simple step-by-step guide to login to your existing Yahoo email account (entering user name and password). Google will likely auto-populate all of the technical fields (SMTP, TLS settings, etc.) for you, making this an even easier and quicker process. Use the recommended security settings. What you’re doing here is ensuring that you will always send and receive in GMail with your existing Yahoo account. (5) Try testing this out to see how it looks. Select the COMPOSE button on the left hand side of the screen and see which email address appears. What you’ve done so far is enabled GMail to send email with your Yahoo email address. Next, you must authorize GMail to be able to receive your Yahoo emails. (8) Another step-by-step guide will appear. Enter your Yahoo email address, then next step. (10) Select the button to “Add Account” at the bottom of the pop-up screen. Checking your ‘Sent’ folder should also have your Yahoo emails that have been sent using GMail. Lastly, when you install the GMail app on your smartphone or tablet, your email settings should all be maintained. In other words, if you’re using Yahoo as your default email address in GMail, it will be your default address whether you send an email on your laptop, tablet or smartphone. Tell me how you make out!